This year was amazing for the team. 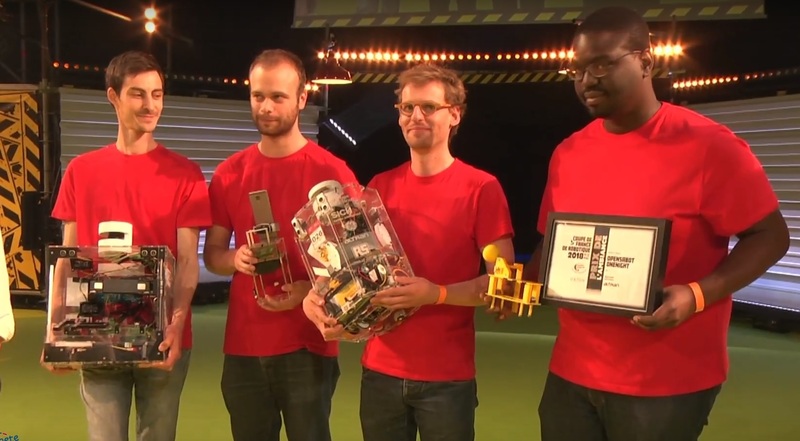 We were a bit late and came with a non finished bot, but we managed to finish the bot 30 minutes before the finals ! We got the bot validated for the cup with the big bot able to build 2 towers of 4 cubes, and the small one pushing the bee and open the panel. For the first qualification game we played against CRoC Team, unfortunately for us, their bot went directly on our big one and collide, making it stop working. The small one was still able to push the bee and open water distributors, but there were to path to go to panel switch. Final score 113 to 0 for us, placing us at the 12th place of ranking. The second game was against Rob’Otter. We were a bit lucky, building 2 towers respecting the color pattern without detecting it. We won 195 to 95, and got 7th place. Third game was against IUT Cachan CRAC. Their bot didn’t avoid our big one, breaking it’s arm. We lost 140 to 157, and went down to 8th place. Fourth game was against IUT GEII Toulon, their bot was not able to start, we won 206 to 0 and got 5th place. For the fifth game we worked hard to get the color pattern detection working, using a cell phone. We played against ENSIM’Elec and won 284 to 121. We made the third best score of qualifications with 284 points after RCVA team which made the two best scores, and got 4th place of ranking ! Being in the top 16 teams made us qualified for finals ! But very good teams were on our path ! The first final game was against A.I.G.R.I.S team, the same one as previous year who kicked us out of final. It was nice to play again witch them. The bot did the job very well, we only failed score estimation: we build the towers with color pattern, but didn’t estimate that it was build. And the bot thought A.I.G.R.I.S team closed the switch of panel, which was not the case. So we didn’t made 284 points again, but won the game, and got qualified for quarter of final. Quarters of final was against ESEO Angers team. They were fast, and came to our side rapidly, messing up the table. There were a lot of bot avoidance without any touch, bot worked well. Unfortunately we lost the game. But that’s not the end ! We came back on stage one more time to receive one of the 4 special awards. We received the award of the collaboration, as we are a team spread on 3 different locations in France, at Toulouse, Belfort and Strasbourg. It was not easy to deal with the distance, we had more tests to do of each part of bots to be able assemble bots one week before the cup and at the cup. We were very short of time, as we finished last update on the bot 30 minutes before the finals, and we played almost all games without having tested bot together before the games. But all unit tests and simulations were great as we only found very few bugs during the games. Integration of all parts was very clean, due to well tested part before. Thanks again to all volunteers, Planet Science and sponsors making this great event possible.